After reading all the rave reviews and the recommendations about the movie, actually seeing it felt like a disappointment. Wonder Woman isn't a terrible film by any measure, it's just that I have a high bar for entertainment. Indeed, it accomplished what it set out to do: tell a straightforward superheroine tale filled with courage, battles, charisma, and spiced with romance and humour. The story begins with Princess Diana of Themyscira, daughter of Queen Hippolyta of the Amazons, discovering a man on the beach. The man is Steve Trevor, an American spy, who discovered a German superweapon factory and was shot down while attempting to flee on an airplane. 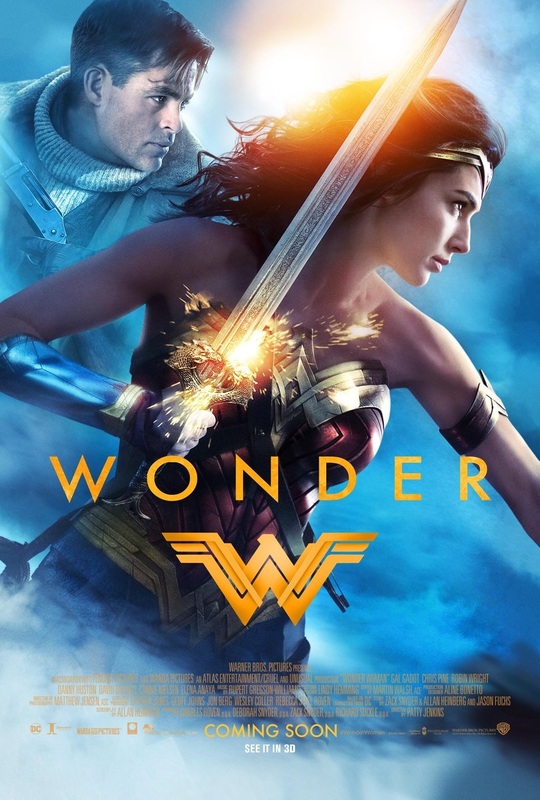 Trevor speaks of the War to End All Wars engulfing the world, and Diana believes that Ares, the god of war, is responsible for instigating the conflict. Having sworn to defeat Ares once and for all, she teams up with Trevor to end the war once and for all. 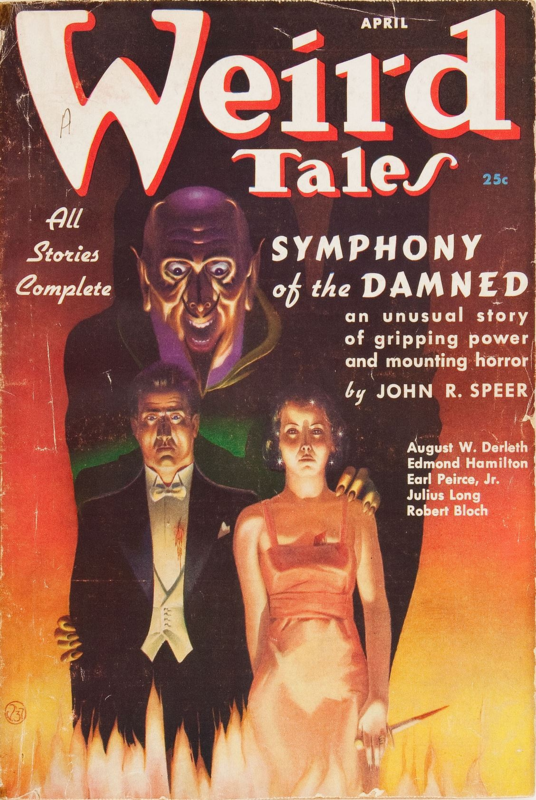 It's a simple story, competently told. But it could be done much better. I am a pessimist, so I shall start with the negatives. The major knock against Wonder Woman was the presence of two major plot holes. When Trevor makes his great escape, Germans intercept him and shoot him down. A squadron of ships chase him to the island of Themyscira, penetrating the mysterious veil that keeps it hidden from the outside world. The ships send a landing party to hunt for Trevor on the island, and the Amazons beat them back. As a set up for a fight scene, it works. But what happens after the Germans are beaten? Consider the situation. The Germans pass through a strange barrier and discover an unmapped island. They send a landing party and see a band of female warriors kill them...with bows and arrows and swords. The logical thing to do would be to rake the beaches with naval gunfire, massacre the defenders, and send in a second landing party to claim the island for the Kaiser and the Reich. 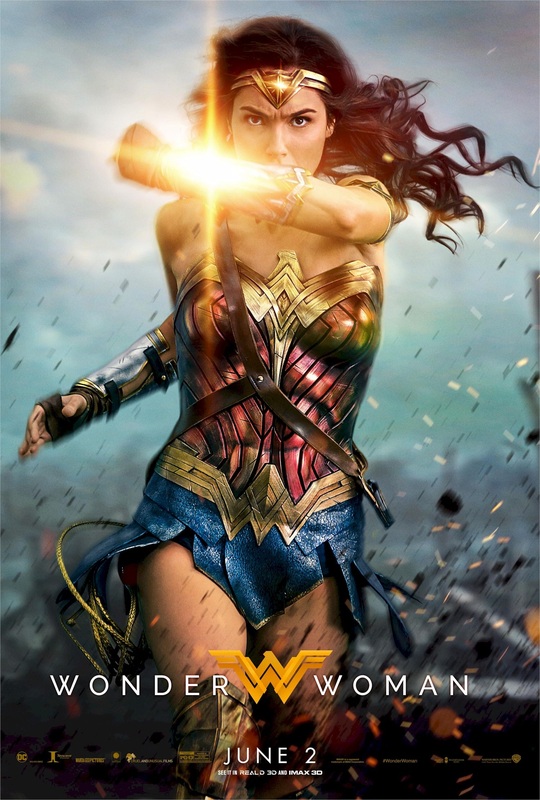 Indeed, this scenario could have provided an impetus for the Amazons to act: realizing that their home is now threatened by the implacable machinery of modern war, the Amazons are forced to flee (or are wiped out), and Diana is driven to stop Ares and avenge her people. Instead, after the beach sequence, the ships simply cease to exist. Here is the first lesson from Wonder Woman: always track your villains and give them agency. Bad guys cannot simply vanish from a scene without good reason, more so if they possess the advantages the Germans did in this scene. Like heroes, believable villains have motives and agendas of their own, and will do everything in their power to meet their goals. By giving them the chance to interfere with the protagonists, the villains will be seen as a powerful, threatening foe and a significant player. Reintroducing the Germans would have added emotional impetus to the rest of the story. Instead, the following sequence is the same tired tale of a child rebelling against a parent by going her own way. Plot hole number two comes near the end of the film, during the showdown with Ares. (Spoiler ahead!) Ares is revealed to have taken the form of a minor character who helped Diana and Trevor reach the frontlines. Which suggests that Ares himself helped Wonder Woman travel to the front, allowing her to defeat him. Why would a supervillain be knowingly complicit in his own destruction? This is lesson number two: Villains should not help the heroes unless it benefits them. A superhero story demands constant conflict between superhero and supervillain. One would expect Ares to do everything in his power to stop the Diana and Trevor: sending military policemen to arrest them, having Allied command brand them as traitors and spies, dispatching the entire German Army to stop them. These maneuvers would have forced the duo to overcome these obstacles and set up Ares as a terrifying enemy. Instead, Ares allowed Diana to discover his weapons factory, derail his plot to continue the Great War, and knowingly meets her, a woman of a race Ares knows Zeus created to defeat him, face-to-face just to have a cliched We Can Rule Together speech. Instead of being a superb and subtle manipulator, Ares comes off as a cardboard character who exists only for Diana to punch out. If a story must have a villain aid the hero, the villain must believe he will benefit in some way, ideally leading to the hero's destruction. That would make for a more clever and complex story, portraying the villain as smart and Machiavellian, and give the hero a chance to shine by reversing the scheme. Central to the movie is a German superweapon, a new chemical weapon that its developers believe will allow Germany to triumph. This Wunderwaffe is seen as an ominous orange gas destroying gas masks and breaking glass, killing all it touches. And just what is this Wunderwaffe called? This is utter nonsense. Mustard gas isn't a gas; it is a liquid. It is deployed as a fine mist of clear droplets, not a thick billowing colored cloud. Further, mustard gas is composed of sulfur, chloride and, in a couple of formulae, oxygen. 'Hydrogen-based' mustard gas would yield, among other things, hydrogen sulfide (which was actually used by the British as a chemical weapon and later discarded) or hydrochloric acid. The only reason 'hydrogen' comes up would be to justify the final major explosion, which is ridiculous. Having hydrogen atoms does not automatically make something explosive: water, among other things, will not ignite. This is the third lesson: if you must use technobabble, it must make sense. If you have to use technobabble in a story, then the properties of said technobabble must be employed in some fashion later on. If you encounter a reader who actually knows something about the science you're pretending to employ, you're going to annoy him. For the purposes of the movie, it would have been easier and quicker to simply call the Wunderwaffe an improved version of mustard gas, or just refer to it by some ominous-sounding codename, and have a character note that it is highly flammable. This achieves the same effect without having to delve into eye-rollingly bad psuedo-science. If you must use technobabble, it should either be clearly fictitious (i.e. made-up science like Minovsky Particles) or suitably and convincingly complex (like everything by John C. Wright). Like every good superhero story, Wonder Woman has plenty of action. Like every Hollywood blockbuster I've seen, I turned off my brain when the action began and tuned it out. The action scenes are competent...for Hollywood...but I hold my entertainment to much higher standards of realism. A critical action scene takes place at the front. Diana hears of the Germans occupying a town and catches sight of refugees somehow being allowed to linger in the Allied trenches. She is outraged, but the army won't help her. She leads a one-woman charge across No Man's Land, plows into the German lines, inspires the rest of the Allies to help her, and single-handedly liberates the town. This scene establishes Diana as an idealistic, driven and impetuous woman. If she can't get what she wants, she simply plows straight through the obstacles, heedless of the consequences. There were just so many things that could have gone wrong. The Germans could have fired on her from so many angles she couldn't block all of the bullets. Shells could have detonated against her armour instead of being deflected. She could have stepped on a mine. She could have run into a cloud of poison gas (and she never has chemical protection). A nearby blast could have blown her off her feet and showered her with shrapnel. Even if she makes it all the way across, the rest of the Allies are mere humans--and the German defenses would have cut them down. The Allies would support their hasty offensive with machineguns and artillery, and she could have been hit by friendly fire. This could have been a scene where Diana discovers that her training was woefully inadequate to prepare her for the horror of modern industrial war. At the very least, Diana could have unleashed her superpowers, justifying her survival. Instead, she survives all this because the plot demands it , and because in Hollywood, Strong Action Females are more powerful than men and never pay the price for brashness. Here is lesson number four: action scenes must make sense. The protagonist cannot survive simply because the plot demands it; her victory must be justified. On the flipside, the enemy must be believably threatening, and an enemy as powerful and dangerous as the Imperial German Army must act in a manner consistent with their portrayal. This means proper defensive tactics and measures designed to defeat an attack they were expecting. Fixing this sequence is simple. Diana tries to cross No Man's Land. Trevor holds her back, and explains to her in graphic detail what happens to idiots who try to make a frontal attack across No Man's Land. She insists on going, convincing him that liberating the town is a worthy cause, and he in turn convinces her to launch a night time raid. Our heroes sneak across No Man's Land, infiltrate the enemy lines and knock out the defenses, allowing the rest of the Allies to overrun the Germans and liberate the town. This scene would have satisfied the demands of characterisation and action while not being suicidal. Despite the issues mentioned above, Wonder Woman isn't all that bad. What sets it apart from other similar films is the character interactions. Diana is a brave, headstrong, stubborn, rash and naïve woman who was raised on an isolated island. She is utterly ignorant about the outside world beyond knowing how to speak multiple languages (a convenient plot device to justify how everyone can talk to each other and how she can read a coded notebook). This shows throughout the story: she doesn't know anything about fashion, she is filled with curiosity about the outside world, and she operates under the childish-yet-believable assumption that stopping Ares will stop the war. Despite all this, she acts in a consistently heroic fashion, fighting for the weak, the innocent and to end the slaughter of millions. This is lesson five: heroes must be heroic. Heroes are memorable because they are larger than life. They have ideals they fight for and lines they will not cross. They will go the distance and commit themselves to their cause. Every aspect of their personality is magnified and consistent throughout the story, and their behaviours flow organically from their backstories and personalities. 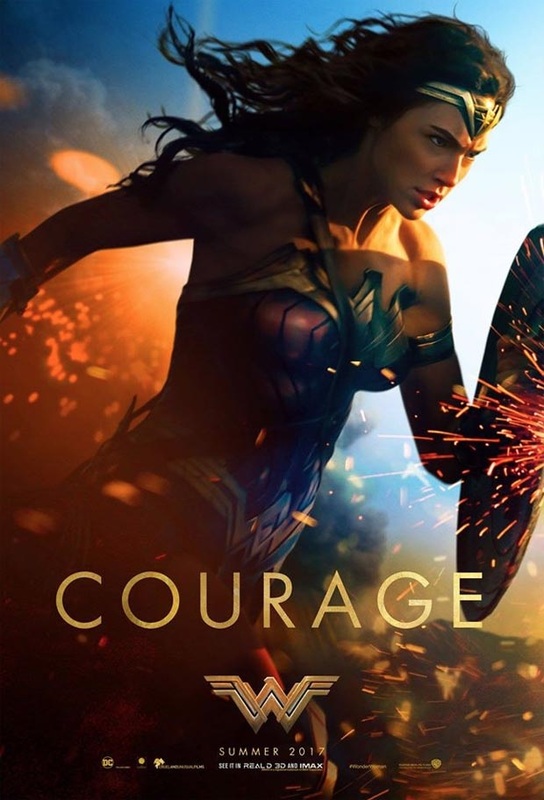 Diana walks with an aura of charisma because she lives and acts with honour and integrity, and Gal Gadot convincingly portrays this on the silver screen. Wonder Woman might be Diana's story, but Steve Trevor plays a significant role too. He helps her navigate the modern world, fills her in on critical details, and fights alongside her in the action scenes. At the climax, he gets a big action scene all to himself, stopping the mundane threat so Diana can concentrate on Ares. Throughout the film, the duo enjoy a respectful relationship. They may have their differences, but instead of sniping at each other or wasting time on pointless bickering, they solve problems and support each other, building each other up all the way to the end. Lesson six: supporting characters must support the protagonist and the story. If a supporting character does next to nothing in a story, then that character can be deleted and his actions handed off to other, more important characters. If a support character does not support the protagonist, then there is no reason why the protagonist keeps him around. This is especially important for stories about superheroes and high-level violence professionals: such people will not tolerate the presence of people who could drag them down and potentially undermine the mission. Instead, they will keep around people who build them up and help them overcome problems, and Steve Trevor fulfils this role magnificently. As an aside, consider this: how did modern culture reach the point where having a male supporting character contribute significantly to the plot and action scenes in a female-led story without being denigrated by the heroine become a noteworthy novelty? 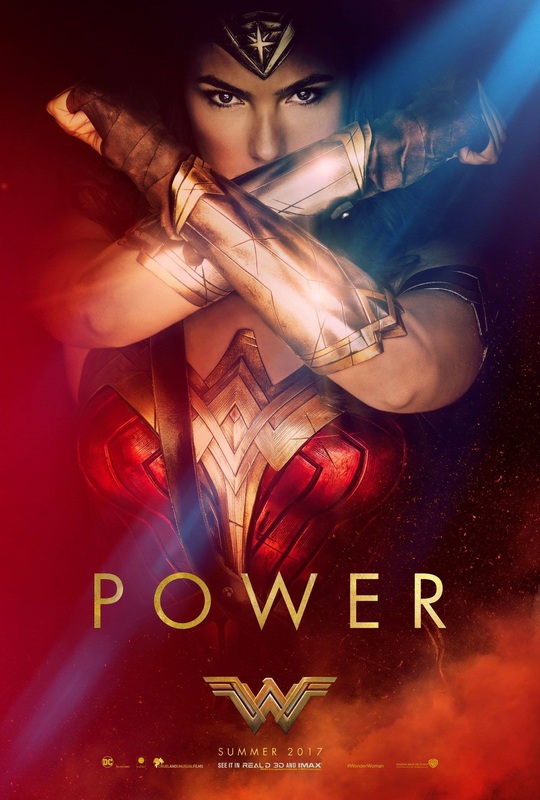 The main flaw running through Wonder Woman is the assumption that Women are Wonderful. Diana makes no major mistakes and does not pay the price. She walks around with a sword in wartime London and nobody bats an eye; she wears her sword in the back of her dress at a fancy dress ball and nobody notices or cares. She leads an Allied army on a suicidal attack across No Man's Land but it somehow makes out unscratched. Ares conveniently comes to her instead of making her fight to find him. As an Amazon she is destined to defeat Ares, so instead of having to work for her victory all she has to do is pour on MOAR POWA until he is defeated. This is the Women are Wonderful trap. In fiction, women cannot be seen to make mistakes so women get away with making stupid decisions. In reality, the police would have hounded her, the Allies would have taken horrendous casualties to support her solo charge (and every death would be on her), and Ares would have opposed her every step of the way and forced her to find him. At every critical juncture, the Hand of the Director intervenes so that Diana need never suffer the consequences of her actions and never has to work hard or change her perspective to accomplish her goals. This is the final lesson: actions have consequences. Play stupid games, win stupid prizes. Charge in recklessly and you get killed, or your allies get slaughtered. Slip up and the enemy will exploit it. Diana survived this adventure and remained an idealist simply because she suffers no consequences for any of her actions. As a writer, you must make your characters reap the bitter harvest of bad decisions. Only then can you have a believable story. Wonder Woman could have been great. Instead, it is distinguished from other Hollywood blockbusters only by virtue of the characters. Learn from Wonder Woman, and craft better stories. 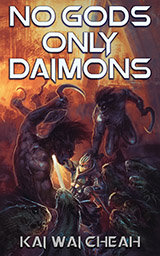 If you'd like to see how I applied these lessons to my writing, check out my latest novel NO GODS, ONLY DAIMONS on Amazon or the Castalia House ebook store. Actually, I would suspect that any Germans who reported that back would at best find themselves in a mental institution. At worst before a firing squad for malingering. Though if you had a German soldier who was trying to work out a way to prove that they were not hallucinating . . . . hurries off to take notes. Top writing lesson we can learn from the post. Visit christian writing lessons online to learn more about writing career.